Spent the last fortnight of 2012 in different locations of central India and have been relaxing in woods of Pench National Park for the past few days. The weather has been clear and it was fun playing around with the dramatic morning and evening light conditions around Pench – a forest with rich natural wonders that induces a photographer’s creativity. Having used the Canon 500mm f4 for so many years it took some time to tune my mind to new Canon 400mm f2.8 ISII but as expected I have fallen in love with the new machine. Here are some of the images created over the past few mornings and evenings. New Delhi, December 8, 2012 : Nature Wanderers – the leading wildlife photography training organisation – launches Nature’s Touch : A wildlife photography show that would showcase the work of a talented bunch of 25 photographers from across India at the Lokayat Art Gallery in New Delhi from December 8th to 13th, 2012. The exhibition is the first of its kind to promote wildlife and nature photography in the capital city of India. The exhibitors are a mix of senior corporate executives, school kids and entrepreneurs who have seriously pursued wildlife photography as a passion and have worked really hard in creating these wonderful images across forests like Bandhavgarh, Ranthambhore, Corbett, Tadoba, Yala (Sri Lanka) and Masai Mara. Leading wildlife film-maker Mike Pandey would be inaugurating this show in the presence of top notch nature photographers of India. In June 2012 when the forests of India were about to close for monsoons, T17 – the lady of the lakes – at Ranthambhore National Park gave a much awaited news as her tiny little cubs were seen for the first time in Rajbagh – an area which she acquired from her legendary mother Machali who ruled this kingdom for over a decade. 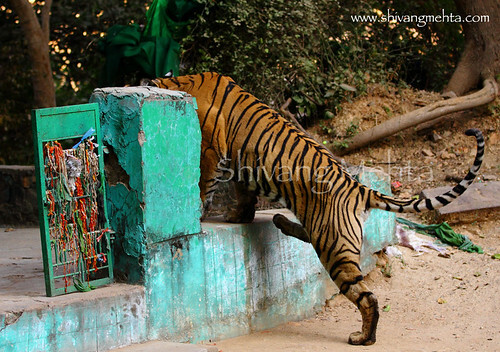 Tiger lovers, photographers and wildlife enthusiasts across India anxiously waited through the monsoon quarter for the park to reopen. The popular belief was that the era of Machali would be back in Ranthambhore with her daughter raising a little of 3 in the majestic backdrops of the palatial ruines of Rajbagh and the Ranthambhore fort. The stage was looking set for the drama to begin but T17 had other ideas. 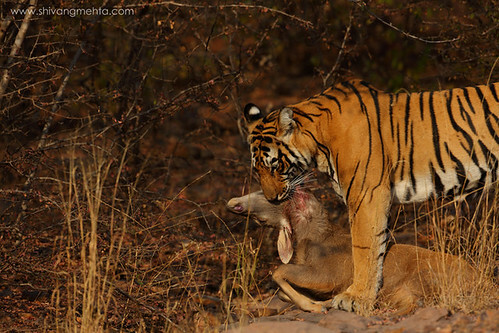 Pressure from dominant males encroaching into her territory forced the inexperienced first time mother to move her cubs out of the prime locales of Ranthambhore as she found a new home in the upper terrains of Kachida. The lady of the lakes now made short and quick visits to her palatial property and started spending more time in an area which was dense and unaccessible by tourists. After the initial glimpses of her cubs through the months of October and November, the protective mother who has always been a photographer’s delight made brief public appearances.